This TCP MR16 is energy efficient, consuming only 7 watts of energy. The 340 lumens of light it produces makes it a suitable replacement for a 35 watt incandescent bulb. 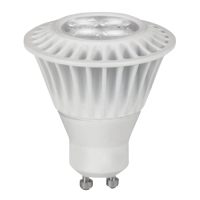 This LED has a GU10 base. With a 3000K color temperature rating it delivers a warm white glow. The light is emitted at a 40 degree beam angle. It is dimmable from 100% to 5%, and not for use in enclosed fixtures.